The people coming to the NAACP convention July 14-18 in San Antonio, Texas, will fill up five hotels. It will be an historic gathering for two reasons: first, American democracy is under attack, according to NAACP President Derrick Johnson. 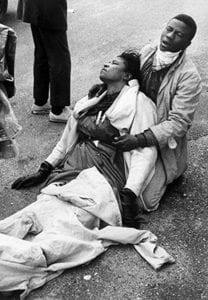 A prostrate Amelia Boynton is helped to her feet after being beaten unconscious on the Edmund Pettus Bridge March 7, 1965. Johnson spoke to women of Delta Sigma Theta sorority June 29 in Nashville. He said getting people to register and then vote in November is the best way to defend against a red tsunami that has engulfed both houses of Congress and the White House. The Supreme Court gave corporations the right to buy elections in the 2010 Citizens United case and last month with the Janus v. AFSCME decision, the Supremes stopped the government workers union from collecting dues from so-called “free-riders”. They are workers AFSCME represents in contract negotiations with government agencies but who don’t like Democrats. The union donates heavily to Democratic candidates and its membership is largely African-American. The bad news doesn’t stop there. Ben Carson, HUD Secretary, wants to raise rents in public housing by 25 percent and has cutback the Section 8 voucher program by $8 billion. The land of the free is looking a lot like the antebellum South for more and more Americans, black and white, who are one paycheck away from the street. Things have not been so bad for so many in a very long time. In 1965 marchers were clubbed and tear-gassed on the Edmund Pettus Bridge in Selma, Alabama. Lying wounded after being beaten unconscious, a photograph of Amelia Boynton showed the world the difference between having a legal right to vote and the harsh reality of trying to exercise it in the American South. The events of that day became known as “Bloody Sunday”. 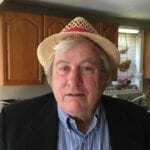 Boynton died in 2015. She was 104. A lot of water has passed under that bridge and now the torch has passed from the old guard to a generation of young organizers who were not yet born when the Civil Rights Movement began. One of them is Tiffany Dena Loftin. She is 29 and NAACP’s Youth & College Division Director. Loftin has a big role at the NAACP convention. Perhaps 5,000 will attend the convention and at least 1500 will be under 30. She plans on training them to get out the vote in November. 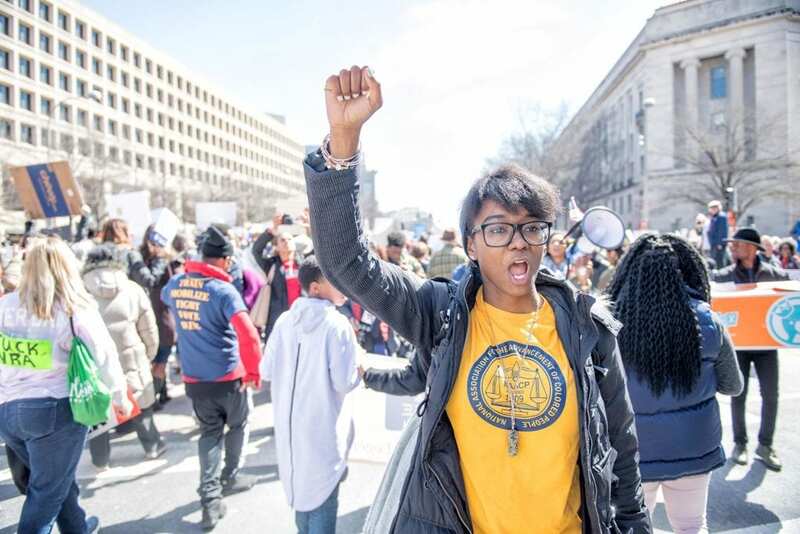 Seeing the new generation take on the challenges facing black Americans today is the second reason why this year’s convention is so important. The question a lot of people will be asking is: are they up to it? 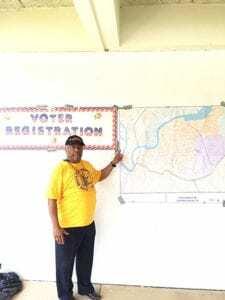 Retired Army Staff Sergeant Dwight Smith uses local maps to educate Chattanooga voters. our communities turn out for this midterm election and beyond,” said Loftin. Last month she was with Women’s March organizers Tamika Mallory, Linda Sarsour, and Carmen Perez when 500 women were arrested in Washington. They were protesting the separation of immigrant families facing deportation. President Trump backed off and families are being reunited but we are still a long way from a Dream Act and immigration reform. Three groups organized that action, an example of what Loftin calls “a coalition of the willing”. “We’ve seen the 50th commemoration of Dr. King’s assassination and the sanitation workers in Memphis. We’ve see the commemoration of the March on Washington,” she said. “It’s always about honoring and giving thanks and thinking through some of those strategic pieces that helped us get to where we are. For young folks it’s never enough. We’re nowhere near done to what we should be experiencing,” she said. Loftin told NAACP President Derrick Johnson, an organizer from Mississippi, that she would not have come to work for NAACP at any other time. He has given her space, challenged her, and she has challenged him back. She said the intergenerational work should continue to look like that. She noted mentors like Johnson are “super supportive” but said young activists have taken a lot of heat from the older generation who don’t want to be in control but still want to tell them what to do. “There are a lot of people in other organizations, folks in the labor movement, folks in the faith movement, there are folks in the civil rights movement who are very critical sometimes and resistant to the radical choices of tactics, and language, and verbiage we use,” Loftin said. “Our job is not to wait for them to tell us how to do it or what to do. Our job is to learn what they did and then take that and run with the torch and that is what we’ve been doing for the last several years,” she said. Dwight Smith, a retired Army man, will be going to San Antonio. He’s treating the midterm elections like a military campaign. He’s got maps, he’s got plans, he’s organizing the neighborhood associations in Chattanooga’s nine council districts. “I ran a supply depot in Iraq so I know how to mobilize people because I’ve had to mobilize my platoon and get them in gear to run supplies up and down the line,” Smith said. Smith says organizing people to vote is no different. He is the NAACP’s Political Action Chairman in Chattanooga. He gives classes throughout the city and herds people from different organizations into his classroom to learn about the political process. “Even though you have different organizations everyone should be on the same page.” Smith buys huge $100 maps of council districts and puts them up in front of the class. He shows people where they live on the map and then tells them how important it is that they vote. “They need to know who the city councilmen are. They need to know who the county commissioners are. They need to know who the people are who are involved in running,” he says. Smith said that sometimes people don’t know the difference between the primary and general election. They don’t know the difference between the county commission and the city council. They don’t know the different between running for the Senate or running for the House. Smith’s classes tell people from neighborhood associations who is running for what in upcoming elections. In Chattanooga there are five state House races, the local school board, and some of the county commissioners on the ballot. About 2200 people live in Smith’s district. Only 1200 are registered and only 300 voted in the last general election. That is what Smith wants to change. “We have taken the neighborhood associations in a district and we put them together and give them the process and they mobilize in their own neighborhoods” he said. When it’s voter time Smith says you have to have transportation ready to make sure voters get to the polls.